The moderator, Matt Scott Young of Australia asked about constrained vs. unconstrained prostheses. Sutcliffe's data was on Charite' patients. MSY has done a lot of Charite's. Sutcliffe noted (what I have been saying for years) that the so-called constrained and semi constrained prostheses all have limits that are outside the limits of motion imposed by our anotomy. "Frankly, I don't think it makes a damned bit if difference", he said! I met Dr. Stark yesterday. My SI Joint Fusion Surgery is coming up fast! Finally got the thumbs up for cervical injection! I'm happy to say that she still hasn't had a hip replacement. Neither of us is pain free, but are both very happy to be how we are now compared to how we have been in the past. 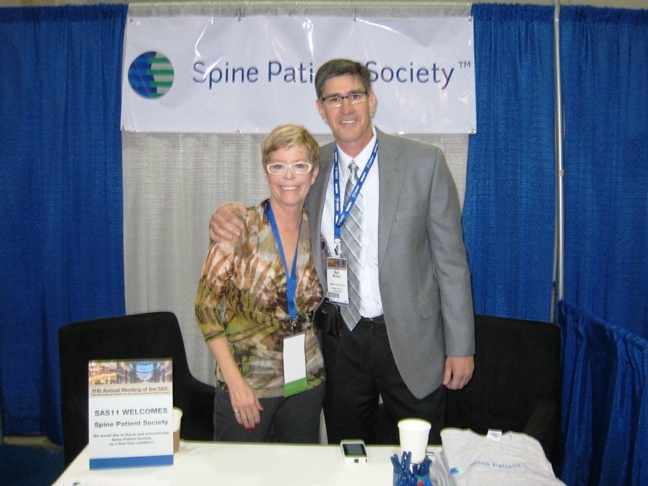 Here I am with CindyLou at the SPS booth. It's been tough getting through the days here... Way too much activity for me. But, I decided to med-up and go see Blue Man Group. What a spectacular show.